Kuala Lumpur, 25 April 2018 – UTM International in collaboration with the Embassy of Denmark in Kuala Lumpur is honored to hold a Global Dialogue delivered by H.E. Jesper Vahr, Ambassador of Denmark to Malaysia. His Excellency Jasper Vahr who was attached to NATO for 9 years and has also served as diplomat in various capacities was warmly welcomed by UTM Vice-Chancellor; YBhg. Prof. Datuk Ir. Dr. Wahid Omar and accompanied by Prof. Dr. Shamsul Sahibuddin; Pro-Vice- Chancellor (UTM Kuala Lumpur) and Prof. Dr. Nordin Yahaya; Pro-Vice-Chancellor (International). 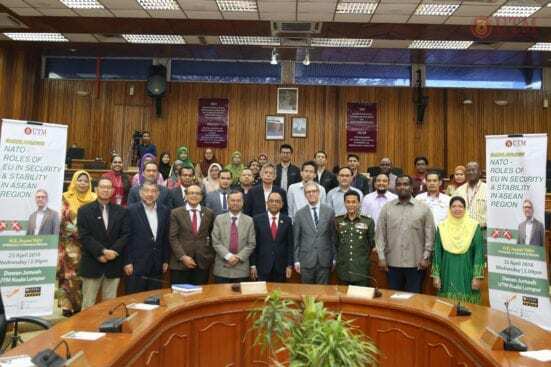 The talk entitled NATO – Roles of EU in Security and Stability in ASEAN Region was attended by Officers from the Ministry of Defense and several other public universities and Embassy of Sudan. H.E. Jesper shared the insights into regional issue and common security challenges facing the region.